A 2015 model announcement already? The new model lists the noteworthy features as an updated engine, a new exhaust system, and LED headlights. Looking at the specs the only noticeable changes are higher compression and a 4lb diet for the Carbon version. Peak power remains unchanged but comes a little earlier, and riders get 2ftlb more torque. Certainly nothing here to transform the bike but that's OK, because it was already a pretty cool ride. 205kg* (452lb) of pure Ducati drives a comfortable sport lifestyle previously only dreamt of. a lower and longer motorcycle. taper down across the engine and into the belly-fairing with oil cooler, the athlete took shape. send a seismic shock through the industry. designed to deliver authentic Ducati performance in every respect. future of motorcycling while staying faithful to its heritage. single seat cover, which is formed in carbon fibre on the Diavel Carbon. a stunning surround effect for optimum visibility. sculpted knee panels add a solid feel to the Diavel and a high tech composite look to the Diavel Carbon. above and below serve to navigate the high-resolution display control panel. balancing high-performance with an enjoyable ride. while ensuring plenty of power remains on tap ready to be unleashed. 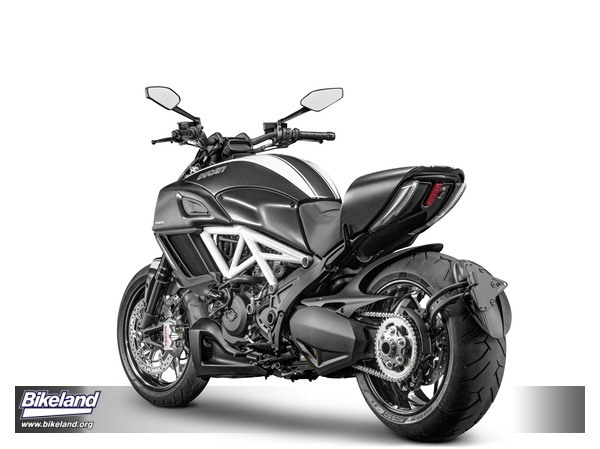 user-friendly character for the new Diavel. enhance that combustion with a higher 12.5:1 compression ratio. optimised fuel mapping for smoother cycle-to-cycle engine operation, without compromising emissions. covers with an aluminium mid-section. end with a wheelbase of 1590mm (62.6in) and a stance that provides lean angles of up to 41°. same suspension with fork sliders black-finished in super low-friction diamond-like carbon (DLC). rebound damping, the unit uses a handy control for easy spring pre-load adjustment. intricate nine-spoke wheels highlight the delicate machining in natural aluminium set against a black finish. with a sport-oriented profile being applied to custom-style width. angles. The tread pattern and compounds deliver great performance in all conditions, especially the wet. between chassis and tyre design contributed massively to Ducati “changing the rules” in this segment. performance actuated by integral alloy master cylinders with unique shape reservoirs sporting milled tops. provide outstanding levels of braking and set a benchmark in this category. fans when required. The design combines form and function to enhance the muscular shape of the bike. clear account of the current Riding Mode, gear selection and DTC setting as well as total mileage and trips. is selected while the stand is still deployed. lock and pressing the ignition-off button a second time. class-leading technologies such as Ride-by-Wire (RbW) and Ducati Traction Control (DTC). closer to the traction limit. comfort for both the rider and passenger. most chaotic of stop-start traffic. the most amount of interaction for complete confidence. easily return all settings to factory pre-sets. runs deep in the DNA of Ducati. against the original black carrier. 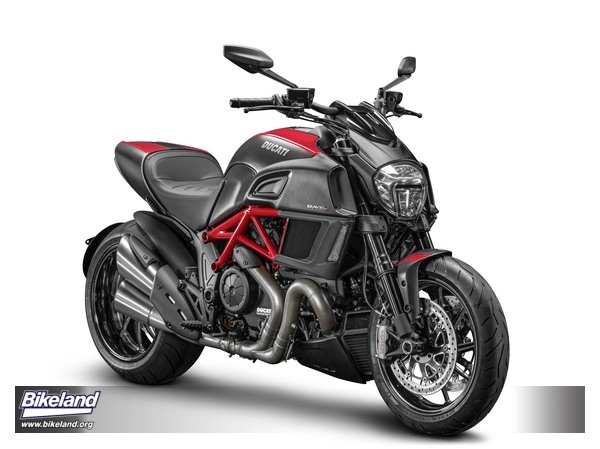 stylish, horizontally-ribbed seat upholstery with prominent red stitching on the Diavel Carbon red model. Fuel Injection: Mitsubishi electronic fuel injection system. Mikuni elliptical throttle bodies with RbW.